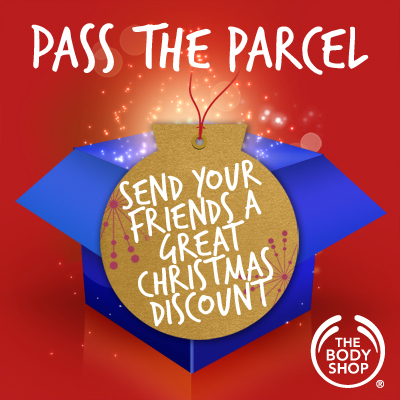 …with Pass The Christmas Parcel from The Body Shop! Click the image above to be taken to the site where you can claim your voucher. After you’ve saved yourself some money, make yourself uber popular by sending the link on to your friends! You can redeem online or in store, I got a 20% off voucher and Mr. L nabbed himself a 15% off voucher. That 30% voucher eludes us this time, can you do better? Find out now. BODY SHOP = LOVE! I’m learning about Ms Anita Roddick (R.I.P :)) in Business. She had greaaaaaat intentions and objectives for The Body Shop. 20% sale, ah, that means more persuading to the mom now! Ahaa, can’t wait! Hi, thanks for the discount link!